When a party breaches a non-compete agreement (with a non-solicitation clause), the non-breaching party typically moves for a temporary injunction. The breaching party is the party that signed the non-compete agreement, such as a former employee or consultant that agreed not to solicit its employer’s customer lists or referral sources upon leaving. The non-breaching party or the party moving for the temporary injunction is the party that is looking to protect its trade secret customer lists or referral sources, such as the employer. “In order to obtain a temporary injunction…[the non-breaching party is] required to establish (1) the likelihood of irreparable harm, (2) the unavailability of an adequate remedy at law, (3) a substantial likelihood of success on the merits, and (4) that the injunction will serve the public interest.” Smart Pharmacy, Inc. v. Viccari, 41 Fla. L. Weekly D1274a (Fla. 1st DCA 2016). Again, a party moving to enforce a non-compete agreement will and should move for a temporary injunction. In the recent case, Smart Pharmacy, an employer regarded its referral sources to be confidential trade secrets. The employer had its employee sign a non-compete agreement that precluded the employee from competing against its employer in a certain geographic area for two years upon the employee’s departure from the employer. The non-compete agreement prevented the employee from soliciting its employer’s referral sources upon leaving (a non-solicitation clause). The employee left and started soliciting the referral sources in violation of the non-compete agreement. The employer sued the employee and the employee’s new employer and moved for a temporary injunction preventing them from soliciting the referral sources. The violation of a non-compete agreement creates the presumption of likelihood of irreparable harm. Thus, this factor is established. An employer has an inadequate remedy at law for the irreparable harm because money damages in this context are difficult to prove with a reasonable degree of certainty and would not fully compensate the employer for a violation of a non-compete agreement. Thus, this factor is established. Soliciting customers of a business is a legitimate business interest. An employee breaches a non-compete agreement that contains a non-solicitation clause when the employee solicits the customers or sources of his or her former employer, meaning the employer has a substantial likelihood of success. Thus, this factor is established. An injunction will serve the public’s interest since it would protect an employer’s legitimate business interest in protecting its customer lists and referral sources. Thus, this factor is established. 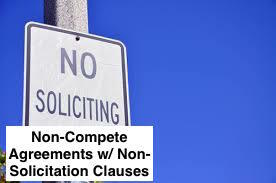 This entry was posted in injunctions and tagged injunction, non-compete, non-compete agreement, non-solicitation clause, temporary injunction by David Adelstein. Bookmark the permalink.